I thought it was time to pull together the bits and pieces that are in various posts into a coherent story! This post is intended as an introduction to the other posts on barrel re-engraving of specific guns and pistols. Before we get into the details, it would be a good idea to discuss the rights and wrongs of recutting engraving! I have no problem with recutting on guns that have almost unreadable engraving and are not unusual or of high value – if something is rare and particularly if its old – say before 1770, then I would think very carefully about the need and justification for recutting – in fact I’d almost certainly not do it. You will sometimes see guns in (proper) auctions that mention that the engraving has been ‘refreshed’ – that’s obviously not to make the gun sound MORE attractive, so it must be intended as a warning – in other words some collectors would avoid it – so be warned! I have recut engraving on barrels of good guns where it is worn much more than the rest of the engraving, but it requires great care to avoid it looking like faking. Mostly I recut things that are being built as ‘bitzers’ to shoot, or not very special guns that have almost illegible engraving, where recutting definitely enhances the gun. Faults include ;- uneven vertical stroke angles, very poor spacing, ‘O’s too small and, stylistically, serifs not Purdey style, spacing too close, letters poorly formed, curved cuts not deep enough or ‘fingernail shaped’ – a complete dog’s breakfast of a job – glad I didn’t do it! Here is another job that I have taken on – this cased double pistol is immaculate – it looks untouched by human hand – except the barrel engraving that looks as if the barrels have been refinished with a little too much vigour. So I have to work some magic on them…. I’ve been asked to recut the engraving on the barrels of a very fine pair of Westley Richards target pistols that have lost legibility on the barrel engraving. 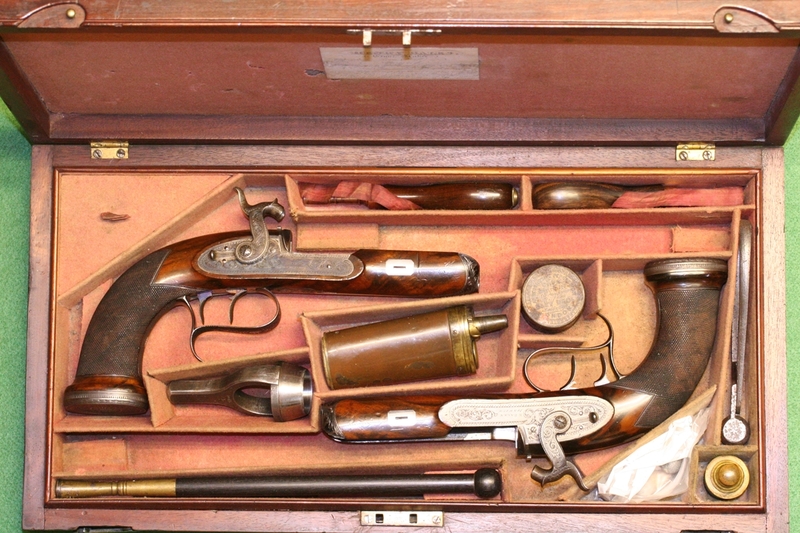 It’s probably wrong to call this a restoration as these pistols are, with one exception, in first class condition.